A co-operative is a kind of company that allows everyone involved to be a co-owner; everyone gets to share in decisions and profits. We think this "one member, one share, one vote" system is democratic, and supports community in a crucial way. 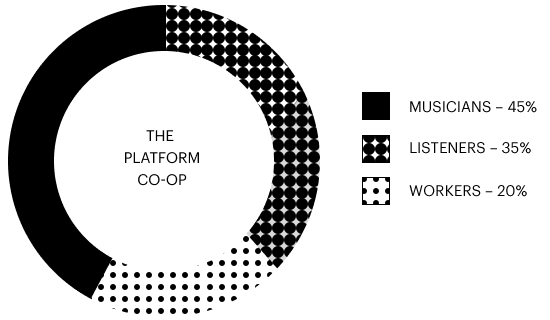 Resonate is a co-op because we believe that everyone should have the opportunity to own their platform, not just mega-rich stars. Everyone involved has a say in how the company runs. Resonate will share any and all profits with consumers (listeners) and workers (musicians, labels, staff and volunteer contributors). Members will be able to trade their profits for more streams and downloads and/or withdraw as cash. It's important to note that co-ops are incentivized to declare profits because they validate the business model. Within these groups, profits will be distributed according to involvement, and not on status, access or other forms of privilege. *Profit distributions are calculated after first removing 30% from the total. 20% is saved for a rainy day fund (a standard procedure for co-ops). If the emergency funds are never used, they'll simply feed back into the next year's profit declarations. The remaining 10% will pay interest for owners of Supporter Shares. Founder members will nominate board members until our membership reaches 30,000. After this, nominations will be open to all our members. Find out more about our current board members here.